Our work as researchers is focused on water, from monitoring to management. We have been working on the Colorado River Delta, the Mexicali Valley aquifer, and the hydraulic system for several years. As the paradigm of the water uses changed in our community, we are aware that our participation as educators should be more efficient. For many years the waters uses in Mexicali were only for urban, industrial and agricultural; now the environment has a voice with NGOs that provide water for the environment in the Colorado River corridor, one of the remaining wetlands in the region, recognized as RAMSAR site. In the city, there are only two superficial water bodies, one in the lagoon complex Xochimilco, Mexico and Campestre and the lagoon located at the city zoo. These lagoons receive waters from irrigation return flows and city pluvial drainage. Mexicali, is located in a semi-arid region, our water resources are two, the aquifer and the Colorado river water, as water scarcity is one of the problems that we can have in the near future, a focus on water conservation is urgent. Upon learning about the EarthEcho Water Challenge we knew that we could educate young people, children, and adults, about the importance of water in our region. Our activity consists of a short talk about the water cycle, water uses, water quality, water quality monitoring, types of monitoring, instruments, quality assurance and standards. After the talk, we lead the monitoring activities with the EarthEcho Water Challenge kits and the participants have the chance to make measurements with other instruments that we use in the lab, such as multiparametrics sensors. The first activity we held took place in the Colorado River Delta corridor at a lagoon near a restoration site of the river, called la Herradura, with Sonoran Institute staff (Mexican section) who are community members that worked in the restoration areas. It was wonderful - the people have a hunger for knowledge to better understand the importance of water quality in the restoration areas and their communities. After that, we worked with university students from the Civil engineering program at Universidad Autonoma de Baja California (UABC). It was a valuable experience for the students to be able to do field work and to know how they can help their communities, their water bodies and how our professional activities can be the answer to local problems. The third massive event engaged 245 students from 6 to 18 years old during an environmental exposition at the city zoo, organized by the State of Baja California Environmental Agency. It was amazing seeing 6 year old children excited about becoming a scientist for a day and participating in the EarthEcho Water Challenge. All the students were astonished about our water uses and how they can participate in water monitoring. Water quality and conservation are challenges that we all need to be aware of and involved in. Our water resources need resilience from their users. It´s great that we can be involved in this huge effort and we are grateful for the chance to participate in the EarthEcho Water Challenge! 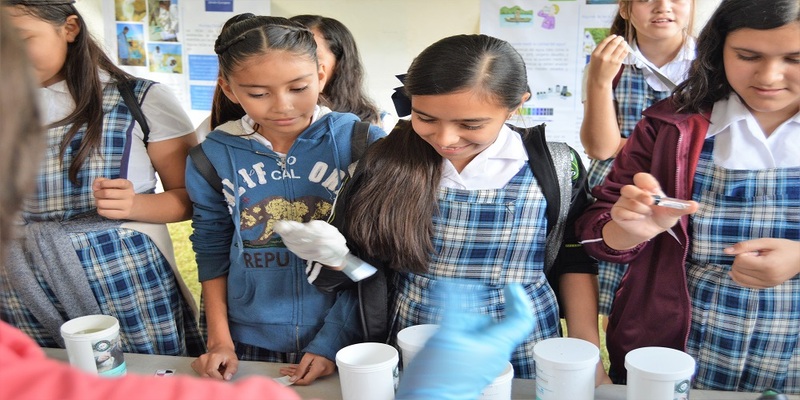 Editor’s Note: We are proud to support the water science and education work being carried out by the Universidad Autonoma de Baja California to empower young people and community members of all ages to monitor and protect local water resources. To learn how you can take part in the EarthEcho Water Challenge, or apply for a test kit donation, visit www.monitorwater.org.